The world of interior design is constantly changing, and while trends may come and go, there are some accents that have true staying power. If you're mulling over what to do with your bathroom vanity, a vessel sink may be a fabulous way to infuse the space with a bit of color and cutting-edge modern design. A vessel sink comes with its own unique advantages that other bathroom accessories can't match. 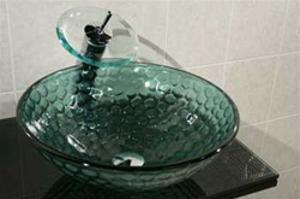 First and foremost, the wide variety of color choices puts this sink at the top of the list for interior decorators, and they can be found in elaborate designs in materials ranging from ceramic, glass, copper, stone or marble. One of the greatest advantages to a vessel sink has to be its utility. If for some reason you get tired of your existing sink, it's far easier to switch it out as opposed to a drop-in sink that's stuck in place. When you're planning out your interior design project, a vessel sink could be the fabulous finishing touch to give your bathroom a timeless aesthetic that you can live with for years to come.